I went snorkeling recently. I was in the water about one minute when I was told there was a 7 foot shark right below me. I got out of the water and did not get back in. I thought you should know. It’s not news that avocados are one of the greatest things on the planet. Nature’s butter. 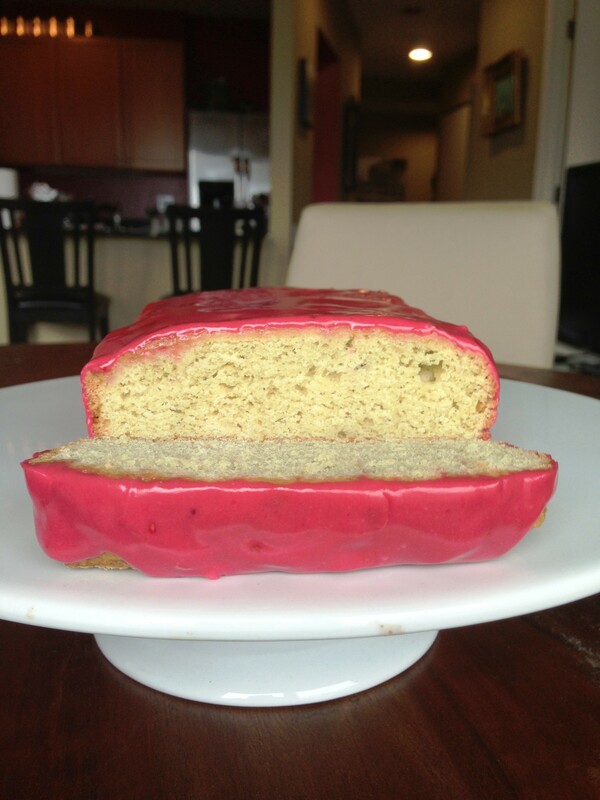 I’ve thought about making an avocado pound cake for a long time but every recipe I saw just didn’t do it for me. They were all basically some deviation of Joy the Baker’s recipe which involved cornmeal. 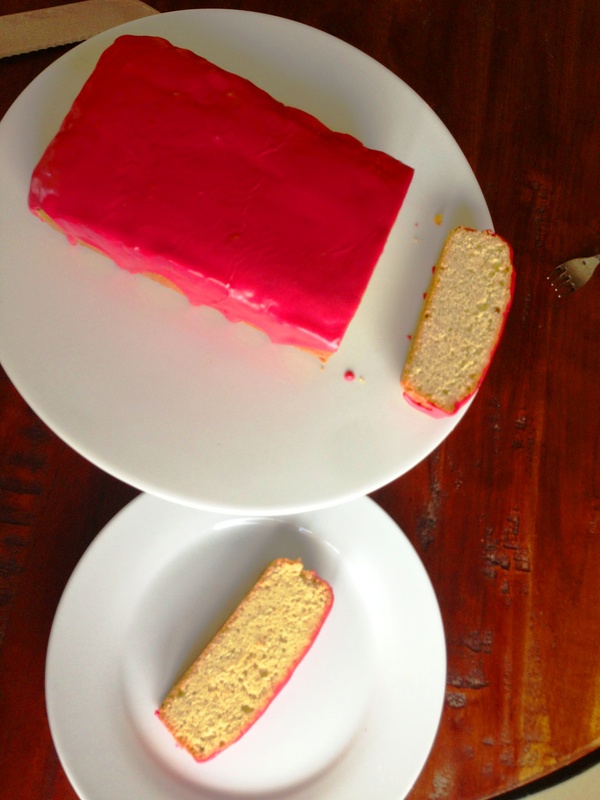 I didn’t want a cake that tasted like cornbread… or even one that tasted like avocados. I just wanted to eat pound cake in mass quantities with slightly less guilt than normal. That’s why I was so pleased when I found this gem of a recipe from Chatelaine. This tastes almost like your traditional pound cake (okay it’s not QUITE as buttery/ moist/ridiculous as a fully loaded p-cake but it comes pretty close). The cake is lightened by using two egg whites and only one egg yolk and, of course, by the avocado substitution. 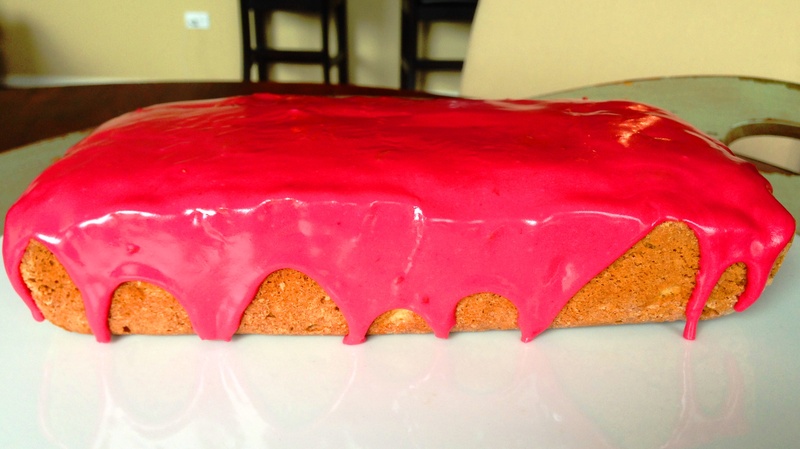 You can skip the raspberry glaze (if you’re crazy) or reduce the amount of sugar/up the amount of raspberries in the icing to keep with the healthy-ish theme we have going here. 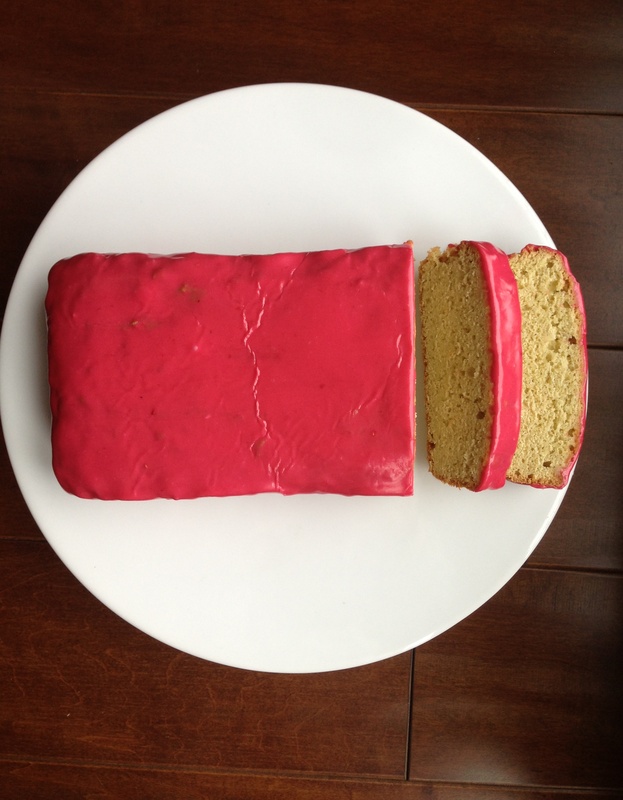 You’ll have a runnier icing that might not quite “set” but I’m sure it will still taste amazing. Whisk flour with baking powder and salt. In a separate bowl beat the egg whites with an electric mixer on medium-high until frothy, about 1 minute. Slowly add in two tablespoons of granulated sugar. Continue beating until stiff peaks form, roughly 3 minutes. In a separated bowl beat avocado puree with butter until smooth. Beat in remaining granulated sugar until very fluffy, about three minutes. Beat in egg yolk, milk and vanilla. Stir in half of flour mixer with spatula. Fold in half the egg whites. Fold in remaining flour mixture. Fold in remaining egg whites. Scrape batter into a greased 8X4-in loaf pan. Bake at 375F for 40 minutes. Cover loosely with foil and continue baking 20 minutes. Cool in pan 10 minutes then set on wire rack to cool completely. 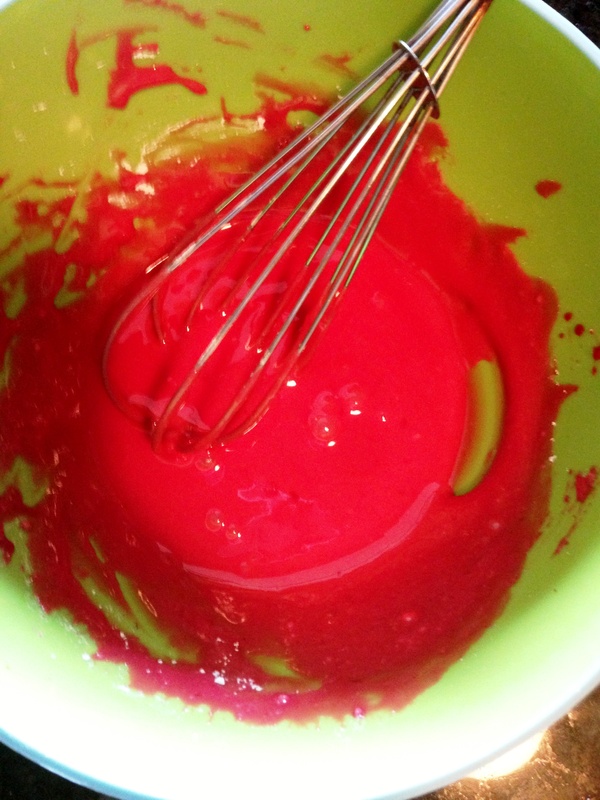 While cake is cooling, make glaze (the color is awesome). Push raspberries through a sieve into a bowl. Discard seeds (you should have 2-3 tablespoons of the raspberry “juice” in the bowl). Whisk in powdered sugar until smooth (sometimes helps to sieve the sugar). 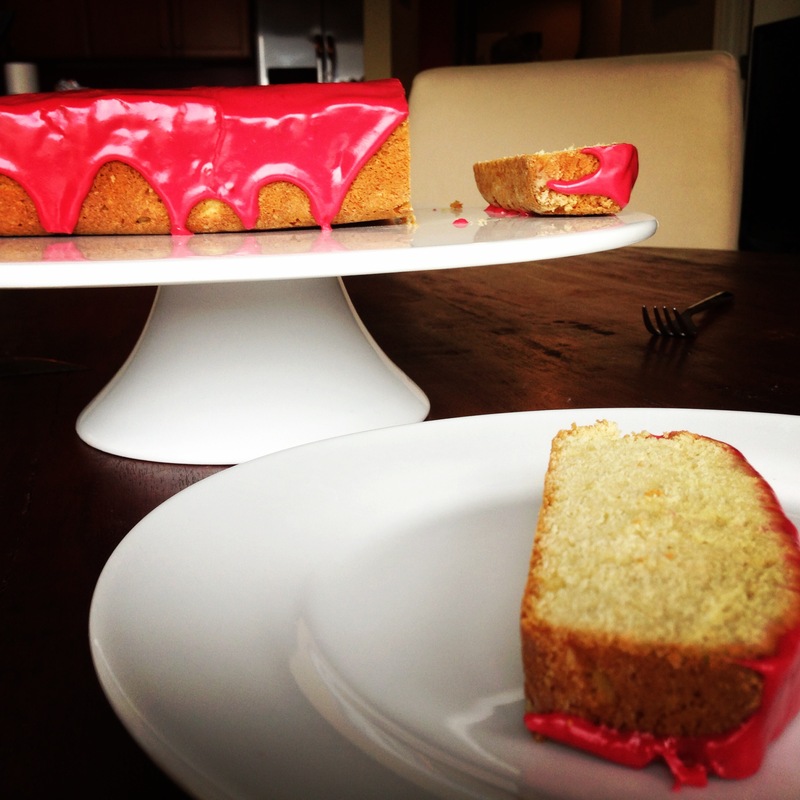 Spoon over pound cake. Mmmm…I think I’m glad you got out of the water but sorry you missed the experience. After the Jelly Fish experience, it was perhaps a good call. Looking forward to trying the pound cake recipe some time!